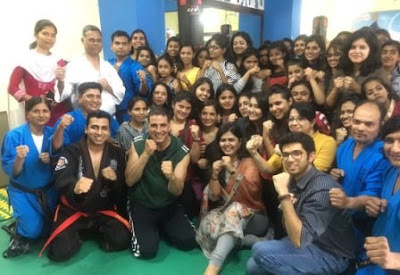 #AkshayKumar along with Aditya Thackeray hosted the 138th Batch of Women's Self Defense Center in Mumbai and expressed happiness on the occasion. The Womens Self Defense Center is a state of the art self defense & martial arts training gym, in the heart of Mumbai, located at Andheri Sports complex, its the only center of its kind in India, Initiated, supported and endorsed by Shri Aaditya Thackeray and Akshay Kumar. The program highlights the study and use of pressure points (weak links) in the human anatomy, techniques specifically designed, to target, easy to reach pressure points, produce devastating results, if used, relatively little or no strength is required to use these techniques, making them ideal for children, women and the elderly. On the work front, Akshay Kumar is geared up with an interesting line-up of work. He will soon be seen in Gold, 2.0, Mogul, Kesari and Housefull 4. Kesari is based on the Battle of Saragarhi. The actor will be seen playing the role of a military commander of 21 Sikh soldiers named Havaldar Ishar Singh who fought against thousands of Afghani invaders.